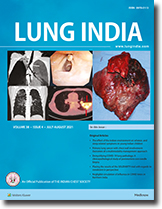 Twenty four cases were subjected to transbronchial or tumour needle aspiration for diagnosis. Group A consisted of 14 patients of mediastinal and/or hilar lymphadenopathy with no intraluminal growth. Group B comprised 10 patients of superior vena cava (SVC) obstruction with intraluminal vascular growth. Overall yield of histological and cytological specimens was achieved in 20 cases (83.3%). Specific diagnosis was achieved in 18 cases (75%). Among Group A, tuberculosis, sarcoldosis and Non-Hodgkinâ€™s lymphoma was diagnosed in six, two and one patients respectively. TNA aided the definitive diagnosis of nine patients (90%) in Group B. The results indicated that 22 gauge needle can provide the diagnosis of benign diseases like tubercular and sarcold mediastinal lymphadenophy and exophytic vascular tumours in patients of SVC obstruction who run the risk of bleeding with conventional biopsy forceps. It is safer than wider bore needle. An epidemiological survey to assess the prevalence of pulmonary tuberculosis among Pallavan Bus Transport Corporation Employees in Madras was undertaken. 8581 (47.2%) of the total 18185 employees were screened by Mass Miniature Radiography. Of the 288 raidological suspects (3.4%), 121 workers (1.4%) had active and probably active pulmonary tuberculosis. Prevalence of bacillary cases was found to be 0.12%. there was no significant difference (p>0.2) in the prevalence of sputum positive cases among various categories of workers. The lower prevalence rates in transport employees might be due to their better socio-economic conditions. Post operative levels of serum IgE were determined in four patients with pulmonary hydatid disease. Pre- and post operative IgE levels did not follow a uniform pattern and thus the latter could not provide a reliable index of either recovery or relapse following surgery. In a survey of 96 asthmatics, who were thoroughly educated and motivated about inhaler therapy, only 38(39.5%) were using inhalers regularly after a follow-up period of three months. Various socio-economic reasons which could be responsible for poor compliance are analysed. The frequencies of ABO blood groups was studied in 250 patients of pulmonary tuberculosis and 250 healthy individuals (controls) to determine whether individuals of any blood group are more susceptible to this disease. The frequency of pulmonary tuberculosis was highest in Group O and next in Group B. This is statistically significant. Oncocytoma is a rare tumour. Its occurrence in a 16 year old boy who has recovered from wilms tumour (resection and radiation) is reported. The literature is reviewed.